More information on the beetle and the epidemic. I wrote this descriptive, generalized paper while I was in prison at PeWee Valley (KCIW), for a night Biology class, offered through the college JCTC. While I have a degree in Biology, it had been 30 years since I had taken an introductory course, so I enrolled in this class on “canteen scholarship.” It was taught by a Kentucky Department of Transportation worker who was in charge of managing the side of the roads. This is a huge job. The strips bordering the roads can mean the difference between life and death for travelers, because vines such as the pernicious kudzu can block views. Also, the instructor spoke at length about the multi-million dollar cleanup effort that Kentucky faced, after the ice storm. After his work during the day, the instructor continued in God’s work by donating his teaching to the college and to the prison inmates. It was one of the most delightful classes I have ever taken. Unfortunately, the prison eliminated education to nonviolent Class D offenders and, in the interest of money, shipped these inmates back into the jails, where there was no hope of college education or treatment of any kind. 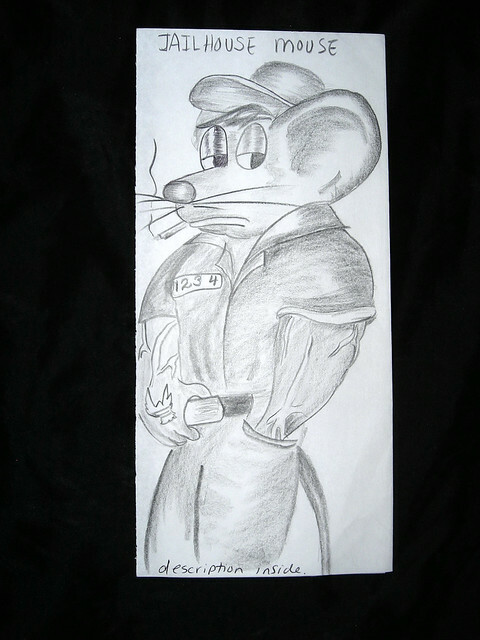 Because of my unusually long eight year sentence, I was not transferred with the other Class D inmates. This placed me into a Class C sort of category, and I “grandfathered in” to continue my schooling. I am thankful. This paper is edited for this site, and I would like to hat tip my nephew Ray, who lives and works in Vail. He was a volunteer in the effort to control the epidemic, and he helped me with some articles, because I had no internet access in the prison. Ray, thank you. 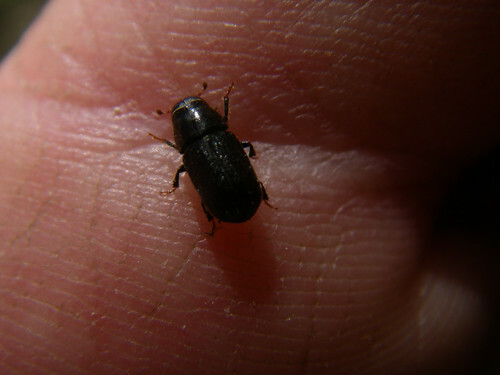 A mountain Pine Beetle, by WBUR under Creative Commons, attribution, noncommercial, nonderivative on flickr. The Mountain Pine Beetle (MPB), Dendroctonus ponderosae Hopkins, is an insect of the largest animal Order, Order Coleoptera (beetles). Its life cycle consists of four complete metamorphic stages: egg, larva, pupa and adult. 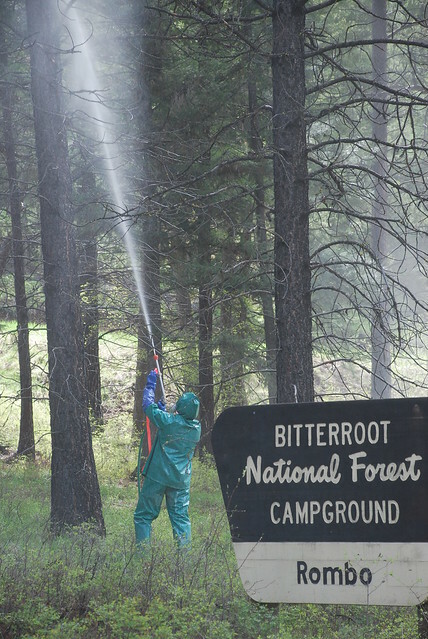 The life cycle lasts about a year, and is completed almost entirely under the bark of host evergreen trees that include ponderosa, sugar and whitepines (major), as well as limber, coulter, foxtail, whitebark, pinyon, bristlecone and Scotch pine. The MPB larvae are parasitic herbivores with biting and chewing mouthparts; most tree damage occurs during the 10-month-long larval stage.-snip-White legless larvae feed on the host phloem tissue from August of one year to June of the next year. Fattened larvae then excavate additional cells for the pupa stage, which lasts about a month. Adults then eat and burrow an exit to the surface, whereupon they fly, sometimes as far as six miles, to neighboring tree stands, where the cycle is repeated. During this flight, often helped by winds, females secrete male-attracting pheromones, bringing more beetles and concentrating attack numbers. Pine trees are gymnosperms (meaning that their seeds are not contained in fruit) that evolved long before flowering plants. A pine contains both male and female gametophytes, a tree’s equivalent to sperm and egg. Female pine cones are fertilized by small male cone pollen. An embryo encased in a seed coat develops, and is dispersed by wind or by animals. Pine trees extract water from the soil and pull it upward, against gravity, in the xylem tissue, through transpiration- a tree’s equivalent to sweating. Photosynthesis in the needles utilizes sunlight to convert CO2 and water into sugar and oxygen. This process utilizes chlorophyll, a green molecule that is similar in structure to animal hemoglobin. Sugar then moves, in solution, from the needles to other tree parts that require energy, by way of the phloem. Since sap-containing phloem cells contain sugar, they are a good beetle food source. When osmotic water flows into high-sugar-concentrated resin-filled cells and tissues, a balanced hydrostatic gradient is established. In healthy trees, a copious flow of sap can actually “pitch out” a beetle attack, such that the beetles drown in the pitch. The tree must not, however, be in a state of stress in order to mount this important defense. I am presenting this in parts, because I believe the entire discussion is too lengthy for the internet. Next: Endemic versus epidemic and conditions that favor epidemic, and the role of fire. 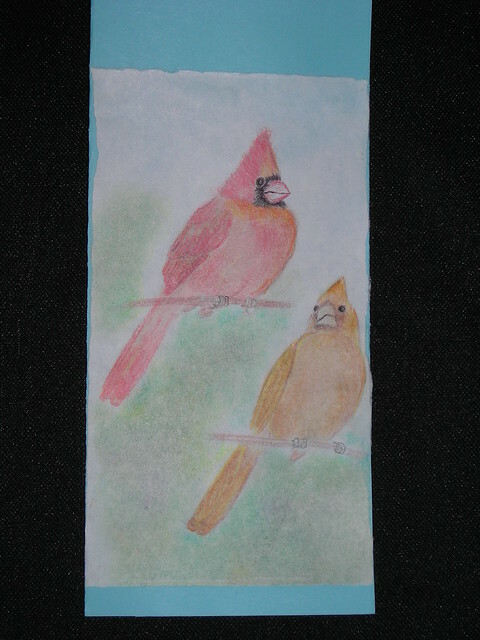 Cardinal couple. Jail art by Crane-Station on flickr. colored pencil and magazine ink. Frog Gravy is a non-fiction account of incarceration in Kentucky, first in jails and then in prison, in 2008 and 2009, and is reconstructed from my notes. We have been on lockdown in Ridgeview Dormitory for a couple of days now, due to an ice storm. Ice has weighted down the razor wire, the power lines, and the trees. This morning, a few of us made our way through the ice wonderland to the dining hall for breakfast. Ice-laden tree branches rattled, like dry bones. Every few minutes there was a loud crack, followed by a thunderous crash, as large oak and maple branches gave way. After the ice formed, it snowed, re-misted, re-iced and snowed again. The cracks and crashes interrupt a beautiful silence. The inside of Ridgeview Dormitory resembles a huge assisted living disaster zone. Inmates from Pine Bluff Dormitory, which houses honors-status inmates serving lengthy sentences, have been moved to the floors of Ridgeview Dormitory, because Ridgeview has power and Pine Bluff does not. In fact, Ridgeview and the recreation building are the only buildings with heat, and so the entire campus has been moved into these two buildings, and placed on lockdown. No “movement” is allowed during a prison lockdown. Inmates must stay in the dorms at all times except during meals. Prison lockdown is an infrequent occurrence. The prison is locked down, for example, when an ambulance comes onto the campus, or when an inmate is unaccounted for. In this case, the lockdown is for everyone’s safety. During the course of the ice storm, an inmate had a heart attack. Another had a seizure. Then, there was a fire in cell block, the disciplinary segregation dorm (fire in the hole! ), so they added the cell block inmates to the Ridgeview mix as well. The dayroom floor in my wing is wall-to-wall inmates on the floor. We have many pregnant guests, as well as disabled women in wheelchairs who cannot care for themselves, and they sit, drooling, looking out through marbled eyes. We also have diabetics and epileptics that need medicine. Medical staff is short. So far, my fantasy greenhouse is even-span, on one to two acres with room to expand. It has an aluminum frame, trusses and purlins, a roof ventilator, two natural gas forced air unit heaters, two horizontal air flow fans, two exhaust fans and polycarb or rigid acrylic glazing. Later, I will choose an evaporative cooling pad and investigate solar power options. I need to decide on a crop for my fantasy greenhouse. I am thinking about roses, because when I suggested tulips, my teacher looked at me like I had just arrived, by way of martian ray gun, from outer space. Also, my mother loves roses. They like 63 degrees and may do well in ground beds, but this would require drainage tile and an irrigation system. Poinsettias will be a group project for the entire class, next year. Poinsettias are a huge cash crop in this country. The flowers are actually modified leaves. Poinsettias take months of advance planning, and they are “forced” to bloom like they do at exactly the time that they do. For this to happen, the entire greenhouse must be completely blacked out like a photography darkroom. Poinsettias bloom in response to short day lengths and any interruption in the blackout can be disastrous to a poinsettia holiday greenhouse crop. Our teacher told us a story of a poinsettia grower who lost the entire crop, because a curious neighbor sneaked into the greenhouse at night with a flashlight to look at the plants. As I study, I also worry about the birds outside. Today I saw a crow surveying the situation but that was it. I have a small collection of bread slices so that, when we are allowed outside, I can toss the birds a few morsels. As I am studying, another inmate stops by and I help her with an algebra problem. I look at the bathroom. It is spotless. Alicia unrolls half of a roll of toilet paper for the faucet, then produces her own bar of state soap, and ritualistically, painfully washes her hands that are chafed from so much constant scrubbing. She leaves the faucet running full stream, lifts up and holds her pant legs off the floor, and tip-toes back to her room, cursing all the way down the hallway. We have sort of learned to live with Alicia and her severe OCD. We avoid touching or brushing against her. She has been known to assault people who accidentally touch her. She has been sent to the hole for such attacks, and I shudder to think how she fared mentally in the hole, where it is virtually impossible to wash your hands. Most inmates just leave the faucets running full stream, because they have given up the faucet battle with Alicia. So, any hour of the day in this wing, both the upstairs bathroom faucet and the downstairs dayroom faucet are running. Somehow the running faucets bother me. I guess I am not used to it and so I wait for her to retreat down the hall and then I turn the water off. I return to my room and look out the window to the field outside. The scene is white and peaceful. This is the field where the turkeys and the deer and the fox live. I look for birds. The field with the ice and the white and the silence is perfect. There is no chaos. Grace. Jail art by Crane-Station on flickr. Ink, colored pencil, magazine ink, a discarded hymnal page, and coffee. I soaked the page in coffee to age it, then tore the soaked edges to make it look charred, dried out the page, and then affixed it to the background page with commissary toothpaste. Again, for the magazine ink (great stuff, I might add), put some canteen Secret deodorant onto toilet paper and then rub the magazine picture. The ink comes right off, but the ink does not look identical to the picture. You have to experiment. 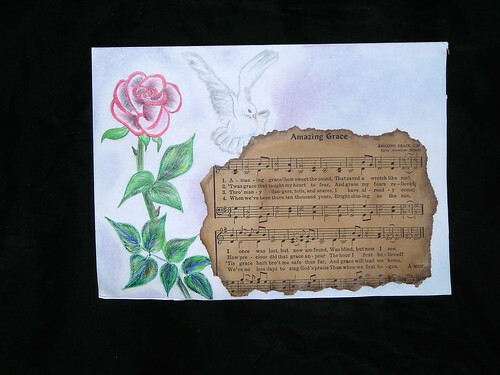 “Amazing Grace” seemed appropriate for today. Author’s note: Frog Gravy is a nonfiction account of incarceration in Kentucky in 2008 and 2009, and is reconstructed from my notes. However, Barkley is a real name. Other posts are at Firedoglake.com in the MyFDL diary section. Today I will work alone all day, in the heavy rain. As I leave Ridgeview Dormitory, an inmate says, “Bird Lady. Look at that bird.” She points and I look. A gorgeous male cardinal perches on the razor wire. Razor wire stretches in every direction, inside and outside the prison. The prison itself is located in an upscale community called PeWee Valley, a suburb of Louisville. Here you have your cul de sac, and here you have your prison. Over here is the dry cleaners and the coffee shop and the bookstore, and yes, over here, the penitentiary. The bird’s foot is almost completely amputated, hanging by skin, turned backward. He extends his wing to occasionally correct his balance, determined to make the best of the very razor wire that caused the injury. I pause to allow an epiphany to take effect, and then continue my walk to work. On the way to recycle, where I break down cardboard boxes, I come across a large earthworm beached on the sidewalk, so I move him. Everything is, thankfully, a quarter of a mile walk or so, a walk I always enjoy. As I pass the main building that houses laundry, Assessment and Classification  (AC), library, transportation, legal aide  and commissary, the most hateful reverse racist guard in the prison that I call Ogre because she is hideous, is yelling at a white inmate that I also know, who is a soft-spoken nurse on the outside. Ogre shouts, “Why don’t you just go to Hell! Why don’t you just go on back to where you came from. Get the hell out of here. Get out of my sight!”  I can see that the inmate is near tears. I was also near tears one time, when Ogre screamed at me for no reason whatsoever, and forced me to put on high-water pants and clothing small enough for a child. I would not be at all surprised if Ogre spoke backward or neighed like a horse, or spoke in a complex mixture of ancient languages and dialects. I see my friend Lisa, who killed her brother-in-law in a drunk driving accident where she was also in possession of a vast mixture of unprescribed prescription drugs, and say hello. She has less time than me: three years, and, the day after Christmas, two days from now, her father on the outside will kill himself, but we do not know this yet. I pass an inmate with her vested service dog in training, named Barkley. Barkley is a seven-month-old cream colored doodle. I am not exactly sure what a doodle is (golden retriever x poodle? ), but Barkley is very sweet and pretty. Everyone loves him, but we are not allowed to touch him when he is wearing a vest. At recycle, the boxes are soaked through, and soaked cardboard turns to slime, but I do not care because I love working outside. After work, I obtain a pass, go the the library, my favorite place in the prison, and check out A Plague of Frogs: The Horrifying True Story, by William Souder, and walk back to my dorm where I speak with my first prison roommate, Ashley, before we go to dinner. Ashley is twenty-three, six months younger than my son, and she looks like a cheerleader. She has been locked up for the better part of six years. She hears from her family about once a month or so, which I cannot imagine, but she says they are sick of her, and so she has s sugar daddy. A ‘sugar daddy’ in this instance is a male on the outside who provides financial support (often substantial) to locked up women. Ashley says, “I’ll need about two hundred dollars to get what I need for the rest of the winter.” She flips through a clothing and accessory catalog. Ashley has a convoluted combination of sentences that she is in various stages of serving, or serving out; I do not really understand it. She comes from a well-off family, and in fact used to be a cheerleader and an honor student. Her family was proud of her. She had brains and beauty and had earned some type of scholarship with the University of Kentucky. But then, Ashley was the driver in a terrible car accident where someone was killed. The victim’s family did not want Ashley to serve prison time, but the Kentucky Commonwealth sentenced her to three years at 85%. This marked the beginning of Ashley’s professional criminal career. She learned how to sell and use drugs and put this skill to use on the outside to pay bills, because no one would hire her with her record upon release. She was caught, but then smuggled drugs into jail, charged with more felonies, and so on. Instead of spending the six years on a university education, Ashley has spent the time in various places of ‘correction’ adding to her skill set as a professional criminal, getting into trouble at one place and being shipped to another. Like me, she spent time in Ricky’s World, Fulton County, where the worst of the worst (or people who write the governor about jail conditions) are sent. A “six thirteen” is a write-up for sexual activity of some sort- kissing or hugging, touching or whatever, and like so many incarcerated young adult women, Ashley was not able to set aside her sexual drive, and became attracted to women. After we talk, I go outside to stand and wait for the announcement call to dinner, and I spot the injured cardinal in a tree. The inmate cardinal is singing. And that is when I realize that music has color. Author’s end note: I do not know Ashley’s whereabouts today, but I believe that she is free, based on a couple of look up searches in Kentucky Online Offender Lookup.